If you've spent any amount of time with me, you probably know how much I love talking about blogging and photography. It gives me a strange sense of joy when someone asks me for SEO or photography advice. Since I've spent some time in previous posts talking about websites and search engine optimization, I felt like maybe it was time to dedicate a few posts to photography. The biggest tip I can give any beginning photography enthusiast is to shoot in RAW whenever possible. All DSLRs offer the capability to shoot in RAW, and many mirrorless or even modern point and shoot cameras do as well. Why shoot RAW? JPEG images are converted by the camera. In the conversion process images are developed according to how the camera thinks they should look. During conversion, much of the original image information captured by the camera's sensor is deleted. The resulting JPEG has had permanent changes made to each pixel and useful image detail is gone. RAW files contain every image detail straight from the camera's sensor with no processing. It gives us the ability to develop the image ourselves however we decide it should look. RAW image files give the creative freedom to process the images, and preserve the image information we need. There are so many times I've been saved by shooting in RAW-- even when images are over or underexposed, the RAW file contains enough information that I can rescue/restore details in the highlights and shadows, or correct white balance/color. In order to take full advantage of RAW files and have the ability to edit them, you need software like Adobe Camera Raw or Lightroom. 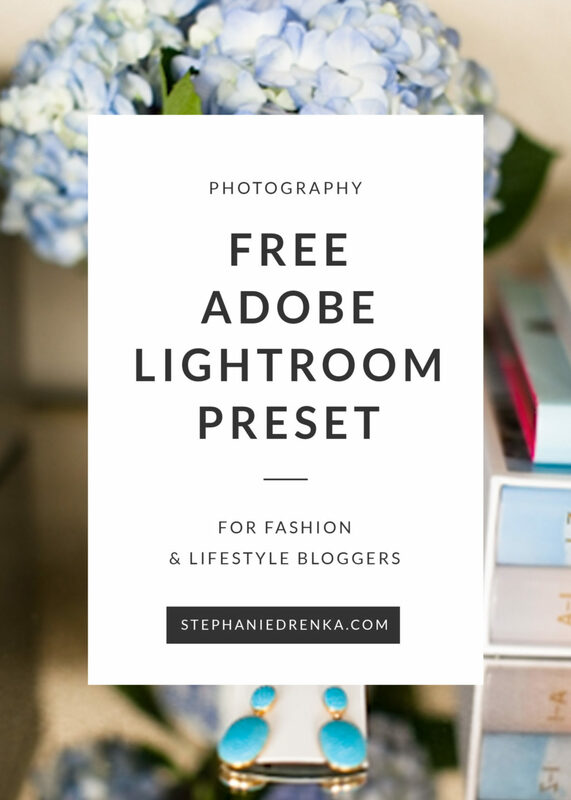 I use Adobe Photoshop Lightroom in my own photo-editing workflow for numerous reasons that need their a separate blog post. The ultimate goal for a digital photographer is to get the picture right in-camera. Shooting in RAW is kind of like a safety net. It gives you some extra wiggle room with the photos, in case you need/want it. In the above photo I took of my blogger bestie, Sevi, I was pretty happy with the image overall -- but it was a little underexposed and in definite need of that extra "WOW" factor. 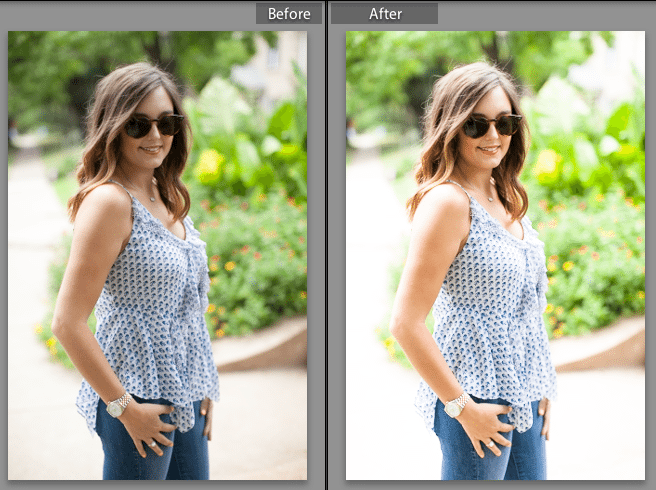 The after image was processed with a custom Lightroom preset I've been working to perfect so I can share it with all of you! I created the Blogger Basics preset to help expedite my own workflow. There are a TON of amazing Lightroom presets you can purchase and download (another reason why you should be taking advantage of RAW files). I have a few favorites I use for certain occasions, such as engagements. But with blog photography, I try to be careful not to over-process the images (unless the style of the blogger or post calls for it). Most of the time, I just want really crisp, clean images with vibrant colors. I created this particular preset as a universal boost for all types of photography-- food, product shots, landscape, or portraits. You can see in this image of Allison from Love You, Mean It that the preset gives the picture a sort of glow. All of this can of course be accomplished in Photoshop manually (or with actions), but the beauty of Lightroom is that once you nail the settings (or find the right preset) for an image, you can apply it to multiple photos in one click! My life is hectic enough as it is, and I gladly take any opportunity to optimize my tasks. I'm excited to make this preset available for other bloggers, because I know how valuable our time is. 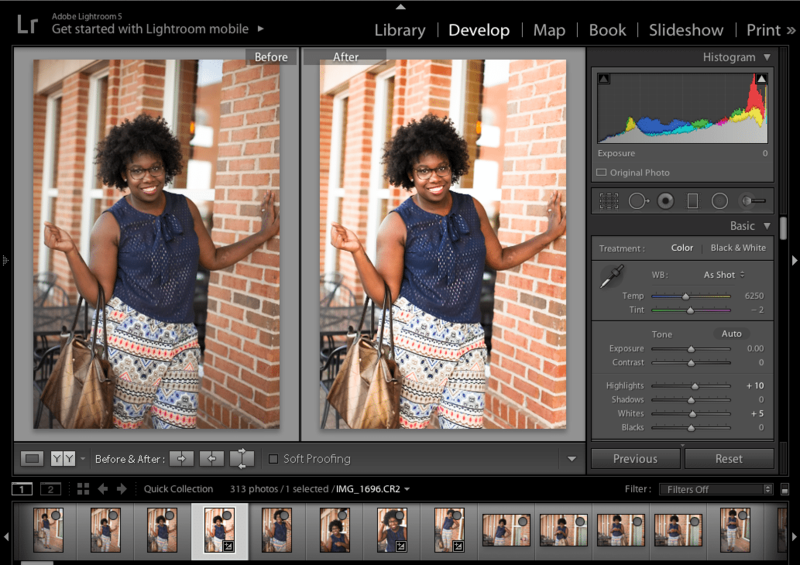 Editing photos is fun, but let's face it-- as blog bosses, we need to spend our time hustling! Looking for a different photo style or aesthetic? 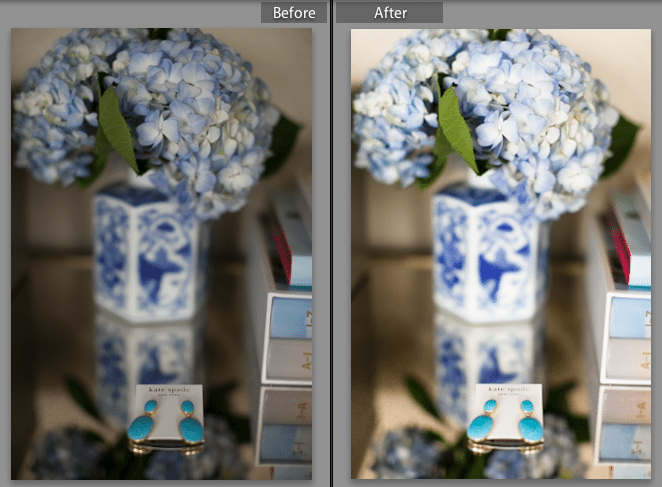 Shop my other Lightroom Presets here. Super excited about the presets! So helpful!! I’m slowly evolving from the iphone6 to a regular camera. haha. First world blogger problems. This is amazing Stephanie! I definitely feel empowered to take my own photos now knowing that I would have some help along the way! Now I just need camera suggestions ! Yes!! Thank you so much– that’s definitely my goal. Empower more bloggers to try their hands at photography! I’m Team Canon; any of their entry-level DSLRs would be great for you! Valery! You’re missing out!! It’s a lifesaver. I’ll bring my laptop to the next happy hour so we can have a crash course lol. Love the tips. I personally shoot RAW and use lightroom and the pics are incredible. Thanks for sharing. As a photography enthusiast, I just love hearing tips from the pro. So exciting, can’t wait to try this! Thank you, you have the best tips! Ohhh you’re welcome– let me know if you need any help installing/configuring the preset! Yay for Genesis! Y’all are ahead of the curve– good job! Super excited about this newsletter! Also- love that you are including photography tips! Keep ’em coming!